Posted on June 8, 2016 January 8, 2019 , in Hot Tubs. Even if you think you know exactly how to choose the right hot tub, there are still many common mistakes that can leave you unhappy with your purchase. Knowing about these frequent mistakes before you begin your quest for a hot tub can help you make an informed decision. We’ve created a list of common mistakes to help you learn as much as you can about potential pitfalls and choose the best hot tub for you. Everyone likes a good deal, but choosing a cheap hot tub can leave you with problems in the long run. As a quick reference point, cheaper hot tubs have price tags as low as $3000, while quality hot tubs cost at least $6000. While it might seem smart to bargain shop, any money you save by buying a cheaper product will catch up with you in the long run when you have to foot large bills for chemicals, repairs, maintenance, and other issues. To arrive at the right priced hot tub for you, think about how much the hot tub will cost over the years, including the monthly expense of running it. A great model may cost more, but if it offers minimal maintenance and outstanding energy efficiency, in the long run it will be worth it. Many hot tubs have cheaply made shells, cabinetry, and exterior features that quickly lead to fading and cracks. 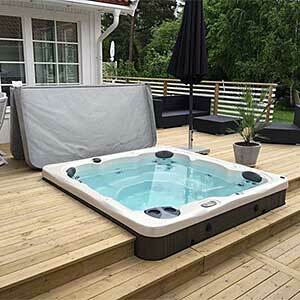 While hot tub exteriors may look similar, they can vary significantly in quality. So, what should you look for in an exterior? An acrylic or thermal plastic shell coated in vinyl ester or bond laminate will provide the durability you’re looking for. When evaluating the cabinetry, seek out options that require little maintenance and are designed to withstand cold, heat, and UV rays. The sturdiest exteriors will also have support beams extending from the lip of the hot tub and also from seats to floor. Finally, look for an extended lifetime warranty to ensure that you can get your exterior repaired for years to come without overspending. People often purchase hot tubs so they can relax at the end of a long day or have a place to connect with friends and family, but if your hot tub requires substantial maintenance, you may spend more time maintaining it than enjoying it. There is no hot tub that can eliminate maintenance, but if you choose a low-quality option, maintenance will become excessive and expensive. First, you should avoid a dealer that pushes you to purchase many chemicals or supplies, as the best hot tubs don’t require additional chemicals to stay clean. Next, look for pressurized filter systems that remove debris from the hot tub as they work more quickly and effectively than suction side filters. Models that can quickly drain and clean the hot tub are also good choices that will save you time. Finally, to make things easy on yourself, use a water repellent every several months to prevent damage to your hot tub. The best hot tubs provide therapeutic relief from sports injuries, pain in your back, legs, or neck, and even from stress or insomnia. Unfortunately, hot tubs provide widely varying levels of therapy because of the style and shape of the jets. It is essential to choose a jet structure that is designed to provide the specific therapeutic benefits you need. Ideally, select a hot tub with adaptable jets that can deliver a large variety of massages to achieve the results you’re looking for. The top models will allow you to adjust the water flow to each individual jet for an individualized massage. Thinking about where your hot tub will be located is essential to choosing the right one for your needs. There are several places where you should never put your hot tub, including areas that are likely to flood and areas near sand which can damage its internal components. Position your hot tub on a level surface that can hold its weight. If you plan to install your hot tub on a deck or patio, make sure to hire a consultant with an engineering background to ensure that the structure will hold the hot tub. If you want to spend less while keeping your hot tub running strong, a full warranty is crucial. Warranties will protect you from shell issues, cracks, peeling, plumbing issues, and mechanical and electrical trouble, all of which can be very expensive. The best warranties include a shell structure warranty up to 10 years, a shell surface warranty up to 5 years, a leak warranty up to 5 years, and an equipment warranty for up to 3 years. Never choose a warranty that is less than 1 year or pro-rated. With so many unreliable hot tub dealers and manufacturers out there, you need to know how to avoid them. They can often be found at expos offering deals that seem too good to be true, when in reality they’re selling hot tubs that will cause you many issues. Looking at online reviews or requesting referrals from customers can help you choose a dealer or manufacturer you can trust. Other things to look for are substantial industry experience, reliable products, and superior warranties. Now that you know more about how to avoid buying mistakes, find out what to look for in a hot tub by clicking below and downloading our free hot tub buyer’s guide.